The Small Animal Imaging Core provides investigators with access to radiology imaging equipment and specialized high end computers and software for research that involves animal models of health and disease. Its function is similar to radiology departments in the clinical setting. Staffed by highly experienced research imaging specialists and technologists, the core provides images to investigators and facilitates image processing and interpretation via collaboration with the Translational Biomedical Imaging Laboratory, the Optical Imaging Core and individual research laboratories. The equipment is typical of instrumentation found radiology department with the addition of special optical based techniques useful for imaging very small subjects: Bioluminescence/Fluorescence imaging, Micro-CT, 7 Tesla small bore MRI, High-Res plain film X-ray, Micro-Spect-CT. 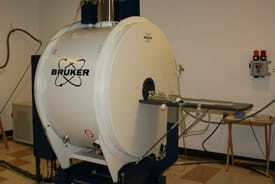 The facility is designed to provide not only imaging technologies, but also guidance in terms of imaging protocols. One of the core's major capabilities is handling different kinds of research projects including working with small rodents with or without imaging equipment. The core is open to academic investigators and commercial/non-commercial organizations. 7.05T Pharmascan uMRI (Bruker) 2003 - This is a small bore, single channel uMRI , capable of running anatomical studies in small rodents( up to small rabbits). We generate data according to the studies for tumor development, metastasis, tracking of contrast enhanced cells (tumors, stem cells, etc.). 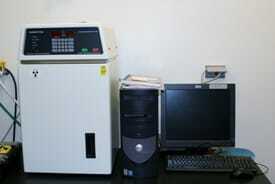 Equipment is capable to run some spectrometries for organic and non-organic compounds. The best in-plane resolution is 83um; in-slice resolution is 320-350 um. IVIS 200 Bioluminescence/Fluorescence (Perkin-Elmer, former Xenogen) 2013 - in vivo imaging technology platform, that allows non-invasive visualization and tracking of cellular and genetic activity within a living organism in real time. 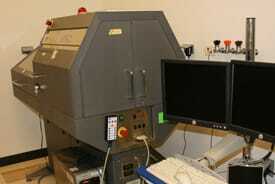 This equipment is work-horse with high throughput capacity. An optimized set of high efficiency filters and spectral un-mixing algorithms lets you take full advantage of bioluminescent and fluorescent reporters across the blue to near infrared wavelength region. It also offers single-view 3D tomography for both fluorescent and bioluminescent reporters that can be analyzed in an anatomical context using Digital Mouse Atlas. Faxitron MX -20- is the industry standard in cabinet X-ray systems for point-of-care specimen/small rodent radiography, specified in bone studies and implants. 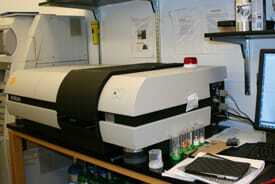 SkyScan1172 HighRes uCT (Bruker) - High-resolution desktop X-ray uCT system for small samples. The flexible geometry of the scanner is particularly advantageous over intermediate resolution levels. Good for biological tissue structural studies. SPECT/CT - This high resolution SPECT system has numerous advantages over the use of clinical gamma cameras and micro-PET systems, including: CT and SPECT to form fusion images to localize radioisotopes signal. The Research Imaging core provides basic images to the investigator. Image processing and interpretation require collaboration with the Radiology Department. Sims JD, Hwang JY, Wagner S, Alonso-Valenteen F, Hanson C, Taguiam JM, Polo R, Harutyunyan I, Karapetyan G, Sorasaenee K, Ibrahim A, Marban E, Moats R, Gray HB, Gross Z, Medina-Kauwe LK. A corrole nanobiologic elicits tissue-activated MRI contrast enhancement and tumor-targeted toxicity. J Control Release. 2015 Nov 10;217:92-101. doi: 10.1016/j.jconrel.2015.08.046. Epub 2015 Aug 31. PubMed PMID: 26334483; PubMed Central PMCID: PMC4623877. Bonne NX, Vitte J, Chareyre F, Karapetyan G, Khankaldyyan V, Tanaka K, Moats RA, Giovannini M. An allograft mouse model for the study of hearing loss secondary to vestibular schwannoma growth. J Neurooncol. 2016 Aug;129(1):47-56. doi: 10.1007/s11060-016-2150-9. Epub 2016 May 13. PubMed PMID: 27177628. Morshed RA, Gutova M, Juliano J, Barish ME, Hawkins-Daarud A, Oganesyan D, Vazgen K, Yang T, Annala A, Ahmed AU, Aboody KS, Swanson KR, Moats RA, Lesniak MS. Analysis of glioblastoma tumor coverage by oncolytic virus-loaded neural stem cells using MRI-based tracking and histological reconstruction. 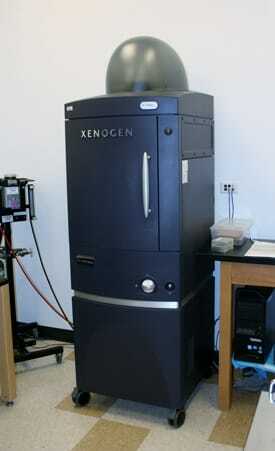 Cancer Gene Ther. 2015 Jan;22(1):55-61. doi: 10.1038/cgt.2014.72. Epub 2014 Dec 19. PubMed PMID: 25525033; PubMed Central PMCID: PMC4293243. Gutova M, Frank JA, D'Apuzzo M, Khankaldyyan V, Gilchrist MM, Annala AJ, Metz MZ, Abramyants Y, Herrmann KA, Ghoda LY, Najbauer J, Brown CE, Blanchard MS,Lesniak MS, Kim SU, Barish ME, Aboody KS, Moats RA. Magnetic resonance imaging tracking of ferumoxytol-labeled human neural stem cells: studies leading to clinical use. Stem Cells Transl Med. 2013 Oct;2(10):766-75. doi: 10.5966/sctm.2013-0049. Epub 2013 Sep 6. PubMed PMID: 24014682; PubMed Central PMCID: PMC3785261. Tang Y, Sharma P, Nelson MD, Simerly R, Moats RA. Automatic abdominal fat assessment in obese mice using a segmental shape model. J Magn Reson Imaging. 2011 Oct;34(4):866-73. doi: 10.1002/jmri.22690. Epub 2011 Jul 18. PubMed PMID: 21769982. Tang Y, Lee S, Nelson MD Jr, Richard S, Moats RA. Adipose segmentation in small animals at 7T: a preliminary study. BMC Genomics. 2010 Dec 1;11 Suppl 3:S9. doi: 10.1186/1471-2164-11-S3-S9. PubMed PMID: 21143791; PubMed Central PMCID: PMC2999354. The Research Imaging Core is equipped with a wide variety of commercial tool sets for imaging data analysis and visualization. Harvey Pollack, MD, MS - Research Associate Sr.